Dual Range Spirit Filled Glass Stick Thermometer 0 to 125°F (-20 to 50°C), 5" long, spirit filled tube, with metal sleeved case. 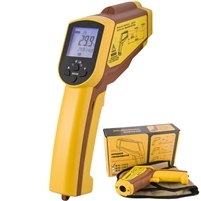 RT301 Pocket Digital Thermometer Range:-50 to 392°F (-45 to 200°C) Resolution:0.1°C or °F Probe:5" x 1/8" dia. pointed probe Battery:1 LR44 1.5V Units: Switchable °C/°F Display updates every 1 second.